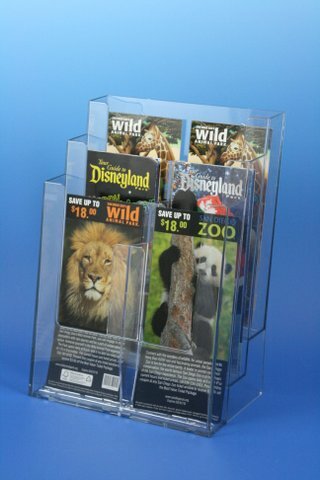 Set the Three Pocket Three Tier Full-Page Brochure Holder on the counter or mount in on a wall. 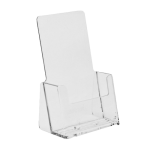 This three tier brochure holder is for material up to 8 ½” wide. The angle of each pocket displays each brochure perfectly, allowing all of your brochures to be displayed in a perfect eye-catching manner. Extra deep pockets allow you to take full advantage of this display. Designed to accommodate materials up to 8 1/2'' wide. 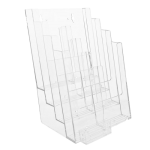 With three tiers available in a compact display, you can display three different full letter size brochures or information sheets. This is a great organization tool for desks or counters. 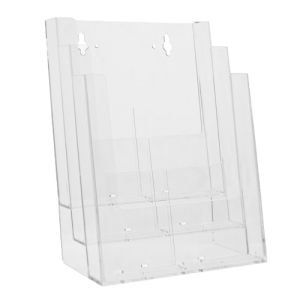 Libraries, institutions, government offices, municipal offices, fast food outlets, application forms, desk top organizing.